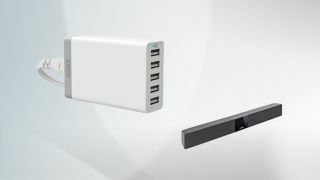 This Anker family-sized 5-port USB charger is a must-have for anyone looking to charge multiple portable devices. Unlike many other models each of its ports is a smart port that detects the type of device attached to it and sends the appropriate current, charging your device as efficiently as possible. Not only that but it's reduced down to £16.99 when you enter the voucher code 7B8ZQTWK at the checkout. We've also spotted a great bargain on this Toshiba Soundbar that's down to £79, saving you £20 on it's usual price tag of £99.